Even in this digital world, it's surprising how much paper a home business can accumulate. Further, there is so much to track in home business, from your financial accounts, marketing strategies, projects, customers, and more. It's essential to develop organizational systems early in your business to ensure you're able to find what you need when you need it. Legal documents (i.e. LLC paperwork, business license, and intellectual property registrations, contracts). Contacts (professional, clients, vendors, service providers, etc). Financial Information (Profit/Loss statements, balance sheets, accounts payable/receivable). Along with this list, you'll want to add items that are specific to your business. For small businesses that don't generate too much paperwork, the binder system is a good choice. It's also ideal for people who like to have everything in one place or who need their information to be mobile. The binder system uses a large three-ring binder, sheet protectors, and section dividers. Use the section dividers to organize your business categories such as pending orders, completed orders, master copies of various forms…etc. From there, you will begin to collect the files in the sheet protectors. Once the binder gets full — at the end of the week, month or three months — it will be time to purge. You'll just transfer customer order files and other historical records to a traditional filing system which closely mirrors your binder's organization. Think about what type of system you will actually use. You can go nuts purchasing cool office supplies and devise the most elaborate and colorful filing system in the world, but if it doesn’t fit your work style, it will be a waste of set-up time and money. Create a system for managing your paper that allows for the least amount of "touches." You want to avoid building piles of paper, and dealing with each piece multiple times. Instead, work to make decisions about where a piece of paper needs to go the first time you touch it. Set aside time for filing. It is easy to avoid this task like the plague, but it is required and will help your business run much more smoothly. Especially receipts and other items used at tax time, keeping this stuff organized makes filing your taxes that much easier. The digital world hasn't completely eliminated the need for paper storage, but it has made storing information much easier. Digital systems can create, send and manage invoices, and it can track your home business finances and then be imported into tax software for e-filing. You can scan receipts and have them stored in a file on your computer (although you should probably keep the paper version as well). Electronic systems can store your clients, customer and prospect information in a customer relationship management system for easy access, emailing, billing and more. Online systems can be used to save your ideas, help you manage projects, organize information or research. 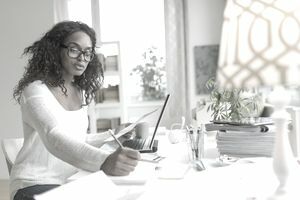 But like paper file systems, your digital filing system needs to have an organizational structure, using folders and files stored on your computer, or in the cloud. For easiest management, use the same structure and file names in your digital system as you do in your paper system. To protect your digital files, backup them up onto a separate hard drive or to an online storage system. Chances are you'll need to use more than one system to manage all the data and material you need to store in your business. First, you'll need to decide what works best for you, and then implement it. For example, you may have a binder system to help you organize day-to-day management of your business such as your schedule, marketing, and copies of your forms. Your traditional system can hold all your long-term papers such as prior years' taxes, permits and business licenses, and intellectual property registrations. You can use a digital system to store your ideas, such as Evernote, and track projects. On the other hand, you may want to be as digital as possible, using an online to-do list and calendar, scanning all receipts into your computer, and using software or online services for all other of your business management needs. Even so, you'll still want a system to manage the paper that does get generated. The key is to find the system that is easy for you to stick with and find the information you need when you need it.